Tropical rainforests covered as much as 12 percent of the Earth's land surface before, but today less than 5 percent exist. In Southeast Asia, the tropical rainforests are found in India, Bangladesh, Sri Lanka, Malaysia, Brunei, Indonesia, Burma and Papua New Guinea. Indonesia contains one-tenth of the world’s rainforest and 40% of all Asian rainforests. 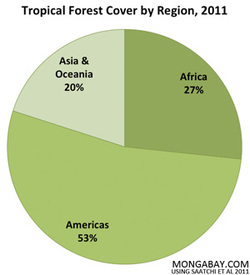 But Indonesia and Malaysia are loosing lots of their rainforest because they are becoming modernized. Zaire basin in Africa contains the largest patch of Tropical Rainforest in Africa and about one-tenth of the world’s rainforest. The largest unbroken stretch of rainforest is found in the Amazon river basin of South America. More than half of the rainforest still remains in Brazil. It holds about one-third of the world's remaining tropical rainforests.